I made a few chicken skewers to go with the ratatouille just thinly sliced boneless chicken breasts marinated and threaded onto wooden skewers. The chicken breasts were rather thick so I sliced thin strips on the diagonal the length of the boneless breast before marinating. Whisk all of the ingredients and add the chicken slices, marinate, covered and refrigerated for at least 2 hours. Soak wooden skewers for a few hours, thread chicken and gill for 10 or so minutes, turning often. For the cut vegetables I used a large cast iron skillet and the veggies came out perfect for me. I didn’t make any changes or at least not drastic ones I simply added some fresh herbs along with the dried herbs called for in the recipe. Fresh basil, oregano, a few chopped rosemary leaves and a pinch or two of red pepper flakes. Heat the olive oil in a Dutch oven over medium-high heat. Add the onion, red pepper, banana pepper, and garlic, and sauté until tender, 5 to 7 minutes. Add the tomato paste, and continue cooking for 3 to 5 minutes. 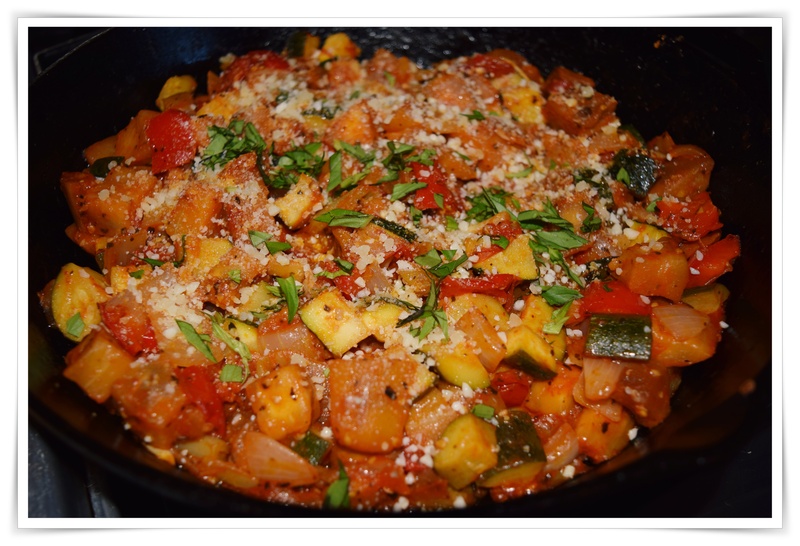 Reduce heat to medium, and add the tomatoes, zucchini, eggplant, and oregano; cook until tender, about 15 minutes, adding water as necessary. Season to taste with salt and pepper, and serve hot with basil on top.